Free money! Who doesn’t love some of that? Well, right now in the junior mining sector, a fantastic arbitrage opportunity exists today that is just begging to be exploited. 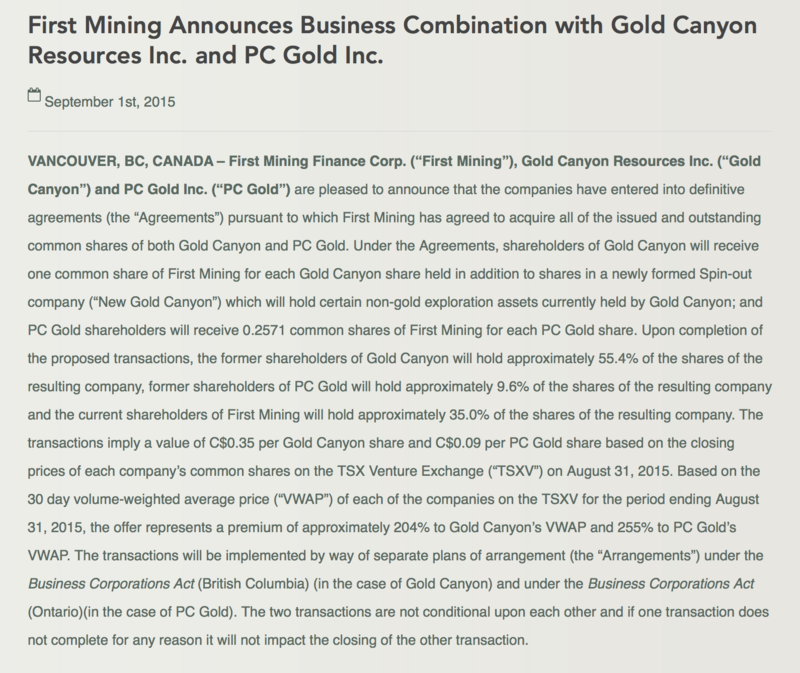 Recently, on September 01, 2015, First Mining Finance (FFMGF/FF.V) announced that they would purchase Gold Canyon Resources (GDCRF/GCU.V) in an all-shares transaction to acquire Gold Canyon’s Springpole Gold Project. In addition to the Gold Canyon acquisition, First Mining Finance also struck a deal to acquire all the issued and outstanding shares of PC Gold. Both transactions were announced in a joint press release statement issued by First Mining Finance, however, each deal is independent of the other, and will complete on its own accord. Please Note — I am particularly interested in the Gold Canyon and First Mining Finance deal, so I will focus solely on that transaction in this article. As part of the agreement (which needs 2/3 shareholder vote to be ratified), upon completion of the transaction, 1 full share of GDCRF/GCU.V will be exchanged for 1 full share of FFMGF/FF.V. In addition, existing shareholders of GDCRF/GCU.V will ALSO receive 0.03333 shares of a new company, New Gold Canyon (which will retain the early stage non-gold exploration projects of the old Gold Canyon company), for each 1 full share of GDCRF/GCU.V owned. As part of the Arrangement, Gold Canyon will transfer its early stage non-gold exploration properties together with C$500,000 in cash and certain other assets currently owned by Gold Canyon to New Gold Canyon. Akiko Levinson, President and CEO will continue in the same roles at New Gold Canyon along with some members of Gold Canyon’s board and management team. Under the Arrangement, each Gold Canyon shareholder will also receive 0.03333 common shares of New Gold Canyon for each Gold Canyon common share held and the holders of Gold Canyon warrants will receive, for each outstanding warrant of Gold Canyon, one warrant of New Gold Canyon entitling the holder to purchase 0.03333 common shares of New Gold Canyon, with the exercise prices of the newly issued warrants being equal to an adjusted exercise price based on the New Gold Canyon exchange ratio. Upon completion, previous shareholders of the old Gold Canyon company will own 55.4% of First Mining Finance. Previous PC Gold shareholders will hold 9.6%, and current First Mining shareholders will retain a 35% ownership stake. So, where’s the arb opportunity for speculators to make money? 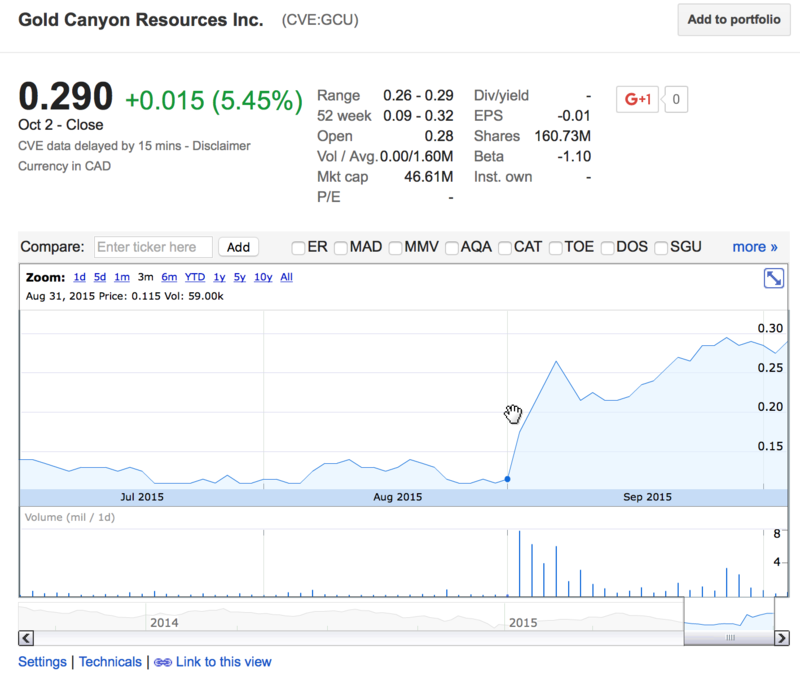 Well, as of market closing on October 2, 2015, shares of GCU.V were trading at C$0.29/share. From the above graph, you can see that on August 31, 2015, shares of GCU.V closed at C$0.115/share. When the First Mining Finance deal was announced the following day, shares surged to close at C$0.175/share. That’s an increase of 52.17%!!! Clearly, investors/speculators caught hold of the press release and took action to take advantage of the arb opportunity. But now… is it too late? Did we already miss the boat on this wonderful deal? 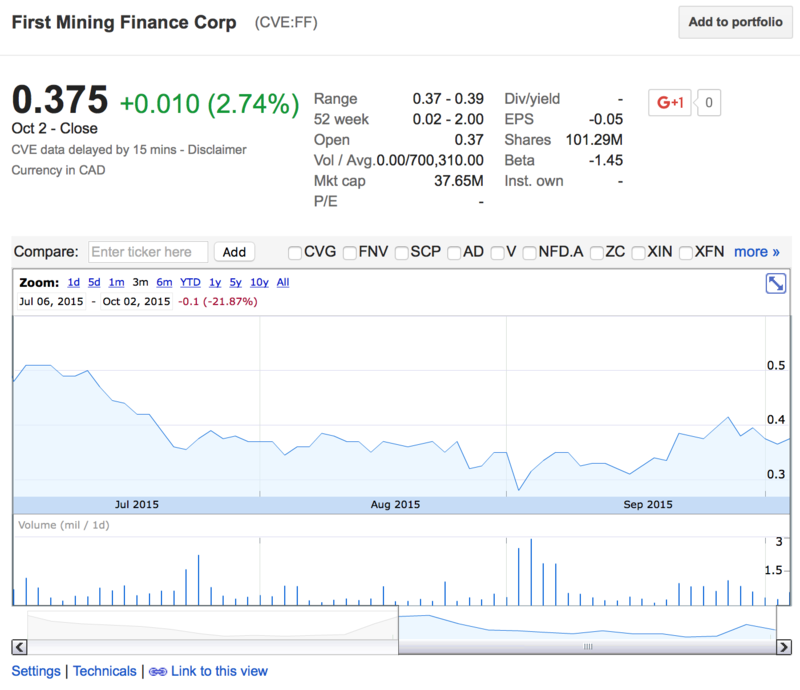 Not really… As of market close on October 02, 2015, shares of First Mining Finance, FF.V, closed at C$0.375/share. Again, once the merger is completed, 1 full share of GCU.V will be converted into 1 full share of FF.V. It will be a 1:1 swap. Plus, you get some freebie shares of the New Gold Canyon exploration company (although I will admit that this bonus “gift” has ZERO bearing on my own decision to speculate on this arb. I’m only interested in the FF.V shares!). That’s still a 29.31% arb opportunity! At this juncture, I would say that the risks are minimal (although it would be prudent to stay on top of any developing news stories as they unfold), since the transaction would benefit all shareholders. The Gold Canyon Transaction will require the approval of at least 66 2/3% of the votes cast by the shareholders and warrantholders of Gold Canyon, voting together as a single class at a special meeting of securityholders expected to take place in early November 2015. The Board of Directors of Gold Canyon has unanimously approved the Gold Canyon Transaction and will provide a written recommendation that Gold Canyon securityholders vote in favour of the Gold Canyon Transaction which will be included in the information circular to be mailed to shareholders and warrantholders in connection with the Gold Canyon Transaction. Each of the directors and senior officers of Gold Canyon, who hold in the aggregate approximately 4.0% of the issued and outstanding Gold Canyon shares (assuming no exercise of existing Gold Canyon warrants or stock options) have entered into a voting agreement with First Mining and have agreed to vote in favour of the Gold Canyon Transaction at the special meeting of Gold Canyon shareholders and warrantholders to be held to consider the Gold Canyon Transaction. Full details of the Gold Canyon Transaction will be included in a Management Information Circular to be mailed to Gold Canyon shareholders in accordance with applicable securities laws. 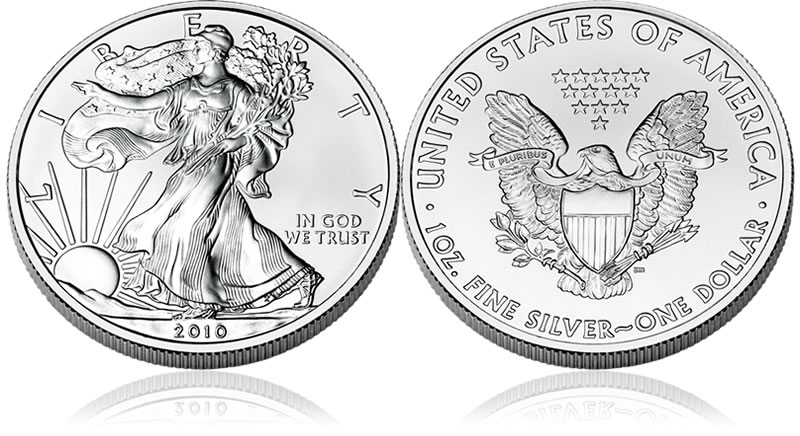 Gold Canyon expects to mail the Information Circular in October 2015. Akiko Levinson, President and CEO of Gold Canyon, stated: “This transaction puts our Springpole gold deposit in the position of forming the foundation for this new, consolidated gold company and we are pleased this transaction reflects this value. Our shareholders receive significant exposure to this new mining company which is run by a proven mining team with a track record of building high valued mining companies”. As I mentioned in my previous article, I’m a huge fan of First Mining Finance, and this junior miner is one that I want to build up a strong position in. But rather than accumulate shares of FF.V today by purchasing on the open market at C$0.375/share, I’m going to utilize the arb route, instead, and pick up cheaper shares of GCU.V for only C$0.29/share! Yes, of course there are more risks associated with going the GCU.V route… For one, the deal could fall apart (although it seems unlikely), and I could be stuck holding a ton of unwanted GCU.V shares. Ultimately, every speculator must decide to do what is best for their own situation. Let’s be clear here — there are risks associated with this arb speculation. For myself, I simply can’t pass up on the 29.31% arb opportunity, so I’m jumping in with both feet. The opportunity to purchase shares of FF.V (through GCU.V) for only C$0.29/share is entirely too enticing for me to ignore… Further, as long as the share price of FF.V can hold up until after transaction is complete, I should have the opportunity to “flip” any unwanted shares for a hefty premium, back into the marketplace. I am a little late to the party, and I only wish that I had found out about this opportunity when it first presented itself in early September. Oh well… I’m still planning on buying up more shares of GCU.V sometime next week. Let’s hope prices stay depressed for slightly longer! Nice find buddy. Those kinda opportunities don’t come along very often. I wish you all the luck on this one, and hope you kill it. 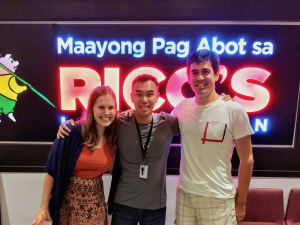 It’s great to see like minded investors doing very, VERY, well! Great tip, thanks. Looks like you’ve already picked up quite a nice gain from it! I don’t know the details but, in this moment, the difference is 24%. Means that arbitrage give some results and can give a lot more if it confirms to be valid. Any idea when the shareholder meeting is? Why isn’t this already priced in? The meeting should take place in November; I would expect an official announcement sometime over the next few weeks. In regard to the arb, this is common in the mining sector right now, and a few months ago there was an arb opportunity for Newmarket Gold when they acquired Crocidile… Nobody really cares about mining right now, which is great for investors like us.